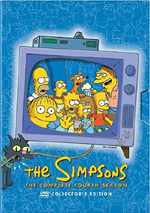 Welcome to the daffy, laffy, fun-as-saltwater-taffy Fourth Big Boxed Set of The Simpsons on DVD, featuring every yok, chortle, titter, and knee-slapper from perhaps the greatest season in the show's history, at least until Season 5. The box is full of many fan favorites: Bart and Lisa's ill-fated trip to Kamp Krusty; Homer's encounter with a five-fingered God (the theological implications of which are staggering); Maggie's great escape from the Ayn Rand School for Tots; Marge, Apu, Chief Wiggum, and Flanders singing their hearts out in "Oh! Streetcar! "; the disturbing debut of Itchy & Scratchy in "Steamboat Itchy"; the legendary Mr. Plow/Plow King rivalry; the animated adventures of Worker & Parasite; Ralph Wiggum's immortal "Choo-Choo-Choose Me" valentine to Lisa; and of course, the classic monorail episode. That's the one that has my all-time favorite Simpsons line, when Homer points at the hissing possum family and says: "I call the big one Bitey." Call it progress: while it took more than a year between the releases of Seasons Two and Three of The Simpsons, Season Four follows barely nine and a half months later! Will this trend continue, or might they even - gasp! - pick up the pace and move the product in less time than it takes to pop out a baby? Dunno, but we Simpsons fanatics will take what we can get. Rather than idly gripe, I’ll just dig into the programs that make up Season Four of The Simpsons. In their original broadcast order, I’ll look at each show individually to document the lows, the highs, and the creamy middles. The plot capsules come straight from the DVD’s press materials. Lastly, I’ll toss in a fun line from each episode; the quotes won’t always be me absolute favorite, but they’ll provide tidbits I find to be amusing that seem to work in the written context. Kamp Krusty (aired September 24, 1992): Bart (voiced by Nancy Cartwright) and Lisa (Yeardley Smith) go off for the summer to Krusty’s (Dan Castellaneta) camp for kids, but instead of meeting Krusty they meet his bean-counting surrogate, Mr. Black (Harry Shearer). 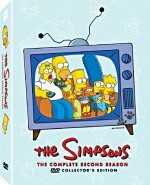 With their children gone, Homer (Castellaneta) and Marge (Julie Kavner) enjoy a romantic summer, but Bart and Lisa are put to work making crummy merchandise until Krusty returns and sets things right - by taking the kids to Tijuana. I never went to summer camp, and this episode reminds me why I didn’t want to go. No, I don’t think the program represents an accurate depiction of summer camps, but it’s close enough for me! The level of degradation offered seems hilarious, especially via Krusty’s usual callousness. It all builds to a great climax with the camp rebellion. A Streetcar Named Marge (aired October 1, 1992): Marge wins the lead in a musical production of A Streetcar Named Desire in which Ned Flanders (Shearer) plays Stanley Kowalski. Marge is infuriated by Homer’s brutishness and insensitivity during pre-production, until he sees the play and reveals to Marge that he has grasped its meaning. While rehearsing, Marge sticks Maggie in the Ayn Rand Day Care Center, where her pacifier is immediately taken from her, and ala The Great Escape, she must struggle to win it back. ”Streetcar” reminds me a little too much of The Flintstones’ “Frogmouth” episode, as both Wilma and Marge get their roles for similar reasons. However, “Streetcar” manages its own identity and benefits from the wonderfully over-the-top presence of Jon Lovitz, who succeeds in two separate parts. A nice musical spoof makes this a good program. Homer the Heretic (aired October 8, 1992): Homer decides not to go to church one Sunday and has the greatest morning of his life. He continues to avoid services, causing Marge to worry about the fate of his soul. Then one Sunday Homer inadvertently burns the house down and is saved by the heroism of the local fire department, manned by volunteers of all faiths. “Heretic” reminds us why religious sorts and those with no interest in the subject can embrace The Simpsons. One could take a message both pro and anti-organized religion from the episode, as its barbs offer no clear path. That makes the show clever and interesting, and it includes the usual collection of funny moments. Lisa the Beauty Queen (aired October 15, 1992): After a caricature artist does an unflattering portrait of Lisa, she enters a junior beauty pageant to regain her self-esteem. She finishes second, but when the winner is unable to fulfill her duties due to a freak accident, Lisa is able to ride in a parade as Little Miss Springfield. But when the cigarette company which sponsors the pageant asks her to promote their produce, she is confronted with a terrible dilemma. Not one of the more quotable episodes, “Queen” goes for more of a low-key, sentimental vibe. Or at least that’s what it does until it turns into something of an anti-smoking screed, though it doesn’t go over the top in that regard. It’s not an actively hilarious show, but it works. Treehouse of Horror III (aired October 29, 1992): In “Clown without Pity”, a Krusty the Clown doll goes berserk in the Simpson home. In “King Homer”, Marge is wooed by a giant ape. In “Dial ‘Z’ for Zombie”, Lisa’s attempt to bring back her dead cat turns the town of Springfield into a pack of marauding zombies. I always thought the Halloween episodes started slowly, as the first couple weren’t terribly good. “III” helps redeem the concept with the first truly strong entry in the series. All three segments work nicely, but “Clown” stands out as the best of the bunch. The interaction between the doll and Homer is priceless. Itchy and Scratchy: The Movie (aired November 3, 1992): At a school open house, Marge and Homer learn that the way they handle Bart’s misbehavior now will set him on the path for the rest of his life. Hence, when Bart’s negligence sends Maggie careening down the street in a runaway car, Homer forbids Bart from seeing the new film about Itchy and Scratchy that is every kid’s dream. Homer makes the ban stick, and in the future, we see that Bart will become Chief Justice of the Supreme Court. Perhaps the first genuinely great episode of Season Four, “Movie” stands as a classic. Some of this comes from the wonderful material connected to early I&S; how can one not love the gleeful parody “Steamboat Itchy”? Homer also seems unusually compelling, from his obsession with Supreme Court justices to his inability to deal with Bart. It’s a great show. Marge Gets a Job (aired November 5, 1992): Marge gets a job at the nuclear plant, where Mr. Burns (Shearer) develops a crush on her. He kidnaps her idol, Tom Jones (himself), in a futile attempt to win her away from Homer. Meanwhile, Bart becomes the boy who cried “wolf” - literally. “Job” follows a classic with… well, maybe not another classic, but a great show. My favorite parts come from the infinitely quotable first act. I refer to my own house as the Slanty Shanty, and I adore the phrase “hand me my patching trowel, boy!” The program continues to work nicely after the first act and remains a fine show. Editing note: when the episode originally aired, Mrs. Krabappel listed Tourette’s Syndrome as one of Bart’s faked illnesses. This later got changed to “rabies” apparently due to viewer complaints. Unfortunately, the DVD doesn’t use the original line, though Bart still mutters “Tourette’s Syndrome” under his breath after his teacher departs. New Kid on the Block (aired November 12, 1992): A single mom (Pamela Reed) moves in next door to the Simpsons with a teenage daughter (Sara Gilbert) with whom Bart falls in love. Unfortunately for him, she has a crush on Jimbo Jones (Tress MacNeille). Meanwhile, Homer sues an all-you-can-eat seafood restaurant when it won’t let him eat all he can eat. One of my all-time favorites, both of “Block”’s storylines succeed. It treats Bart’s first crush in an affectionate but not sentimental way. Most of the laughs come from the “B”-story, though, as Homer’s lawsuit is hilarious. These components add up to a great show. Mr. Plow (aired November 19, 1992): Homer starts a thriving snowplow business, only to have his best friend Barney (Castellaneta) start a rival service, complete with commercials featuring Linda Ronstadt. Homer is so jealous he sends Barney into an avalanche and certain death, then repents and risks his own life to save his friend’s. “Mr. Plow” has to be one of the series’ best episodes, as it’s packed with laugh out loud moments. The plot’s idiotic but the show makes it work shockingly well, mostly because I was too amused to worry about the stupidity of the concept. And guest spots don’t get funnier – or more bizarre – than Adam West here. It’s a brilliant show. Lisa’s First Word (aired December 3, 1992): In this flashback episode, we see the birth of Lisa and young Bart’s jealousy towards her. But he softens when he hears her first word: “Bart”. Then we hear (but no one else does) Maggie’s first word, voiced by Elizabeth Taylor. The series’ third flashback episode, the first two worked well, and this one follows suit. It’s fun to watch the development of the family Simpson, and two-year-old Bart offers lots of good opportunities for mischief. The best parts come from Bart’s time with new neighbors the Flanders, though Homer’s home-made clown bed remains wonderful. Homer’s Triple Bypass (aired December 17, 1992): Homer has a heart attack, leaving him near death. He must get a bypass operation, but is only able to afford the cut-rate doctor, Nick Riviera (Hank Azaria). Guided by Lisa, Dr. Nick performs the surgery and saves Homer’s life. When I first saw “Bypass” in 1992, I thought it offered a weak piece. I’ve warmed up to it somewhat over the years, but other than the clip show, I regard it as Season Four’s worst program. The comedy feels more forced than usual, and “Bypass” comes across as a fairly lackluster piece. Marge vs. the Monorail (aired January 14, 1993): A fast-talking con man named Lyle Lanley (Phil Hartman) sells the people of Springfield a monorail, and Homer is thrilled to be the conductor. Marge warns that the monorail is a mistake, and is proven correct when it speeds out of control with VIP passenger Leonard Nimoy. After the weak “Bypass”, the series rebounds wonderfully with the excellent “Monorail”. Another episode that merits the moniker “classic”, this one takes the show into even more bizarre than usual territory, where it goes in a terrific manner. From the great opening parody of the Flintstones theme through the disaster flick spoof at the end, this one fires on all cylinders. We even get a superb and semi-surreal guest turn from Leonard Nimoy. “Monorail” makes virtually no missteps and stands as a winner. Selma’s Choice (aired January 21, 1993): A death in Marge’s family sends the Simpsons to a funeral and makes Selma (Kavner) wonder if she should have a child before it’s too late. But after she takes Bart and Lisa to the Duff Gardens theme park - where Lisa drinks water on a ride and goes berserk - Selma scratches her maternal itch with a pet iguana. While not quite up to the level of “Monorail”, “Choice” continues Season Four’s high standards. Selma-oriented shows usually work well, and “Choice” is no exception. Despite her status as a secondary character, she gets some good time here, and the visit to Duff Gardens is excellent, as is the absurd subplot connected to Homer’s spoiled sandwich. Brother from the Same Planet (aired February 4, 1993): When Homer is late picking up Bart from soccer, Bart decides to get a “Bigger Brother” who’ll take care of him. Out of jealousy, Homer gets a “Little Brother” and then gets in a knockdown drag-out fight with Bart’s Bigger Brother. Meanwhile, Lisa runs up a huge phone bill calling a 900-line run by a teen film star. Another day, another terrific program. Competition between Bart and Homer usually works well, and I especially like the bits where Homer tries to be a role model for the sadly adorable Pepi. Homer’s negligence sets up the story nicely, and it continues to excel the rest of the way. I Love Lisa (aired February 11, 1993): Feeling sorry for luckless classmate Ralph Wiggum (Cartwright), Lisa gives him a Valentine. He develops a huge crush on her, which ends unhappily when she tells him that she doesn’t reciprocate during a Krusty the Clown special. Ralph’s dad, Police Chief Wiggum (Azaria), takes vengeance on Homer, but in the end the kids agree to be friends. Another episode with a potential to be sappy, “Lisa” mainly manages to avoid that trap. It gives us some out of character behavior from Ralph - no way the school’s dumbest boy could turn into its finest thespian - but at least it allows him to develop in some way. Not one of Season Four’s best programs, “Lisa” still manages a lot of laughs. Duffless (aired February 18, 1993): After skipping work for a Duff brewery tour, Homer is arrested for driving while intoxicated. He is at first miserable, but uses the opportunity to find out what life is like without beer. Meanwhile, Lisa makes Bart the subject of a Clockwork Orange-style science fair project. Just like the visit to Duff Gardens was hilarious, the trek through the brewery also opens up plenty of laughs. This culminates in one of the most amusingly violent non I&S bits during the series when Homer tries to stop Barney from driving drunk plus plenty of nice bits from sober Homer. Last Exit to Springfield (aired March 11, 1993): Lisa goes to the dentist and learns she needs braces. At the same time, Mr. Burns tries to remove the dental plan from the plant employees’ benefits, and an upset Homer becomes a union leader, taking the workers out on strike. Burns tries to run the plant with robots, but cannot dent the workers’ resolve and agrees to restore the dental plan if Homer will resign as union leader. According to this episode’s commentary, some fans once voted “Exit” one of the series’ best programs ever. I disagree, as I think it’s actually a pretty bland show and one of Season Four’s weaker episodes. In later years, the series would feature a lot of shows that looked good on the surface but simply lacked the quirky cleverness and kick of the funnier pieces. “Exit” falls into that category; I can’t put my finger on its exact problems, but it simply fails to engage or amuse me much. So It’s Come to This: A Simpsons Clip Show (aired April 1, 1993): In this April Fool’s Day themed clip show, Bart shakes up a bottle of beer, intending to soak Homer, but winds up putting his father in a coma. The family reminisces about the past while waiting at Homer’s bedside. Is there any such thing as a good clip show? Yeah, as this one offers more merits than most. It helps that it contains a reasonable amount of new footage, and the unique material presents some good laughs. Indeed, I laughed more during this show’s initial four minutes of new set-up than I did in all of “Last Exit”. Add to that some well-chosen clips and a cool “d’oh” montage and “This” seems good. The Front (aired April 15, 1993): Bart and Lisa write Itchy and Scratchy cartoons using Grampa (Castellaneta) to submit them to the studio. But when one wins an award, Grampa is appalled to see what he has been putting his name on. Also contains a short, short feature entitled “The Adventures of Ned Flanders”. “The Front” definitely has its moments, and it generally seems like a good show. It doesn’t quite manage to hit the heights of the better programs, but it includes more than a few fun moments. The bizarre Flanders bit at the end concludes the show on a delightfully odd note. Whacking Day (aired April 29, 1993): Springfield engages in an annual ritual of whacking at snakes with sticks - a ritual Lisa is determined to stop, with the help of guest star Barry White. Meanwhile, Bart is kicked out of school after a prank and home schooled by Marge. Am I wrong to be bizarrely proud that they set Whacking Day on my birthday? But that’s not the only thing that makes this a memorable show. It’s amusing to see Bart’s schooling, and the shenanigans that surround Whacking Day also work well. Marge in Chains (aired May 6, 1993): A flu epidemic sweeps through Springfield, and Marge must care for her entire family. She is so distracted, she inadvertently shoplifts from the Kwik-E-Mart and is sent to a women’s prison, leaving the family to fend for themselves. Without Marge’s marshmallow squares, the Springfield Parks Commission must purchase a statue of Jimmy Carter instead of Abraham Lincoln, and the town realizes its error and releases Marge. I like episodes that start one way and veer off in another, and we get that from “Chains”. The first act details the effects of the flu, and then we see Marge’s plight. How can you not love a program that mentions Flintstones Chewable Morphine? Krusty Gets Kancelled (aired May 13, 1993): A rival TV show starring an incredibly talented ventriloquist’s dummy goes on opposite Krusty, and he is taken off the air. Bart and Lisa decide he must do a comeback special to save his career. They enlist the help of Johnny Carson, Bette Midler, Luke Perry, Hugh Hefner and the Red Hot Chili Peppers, and the special is a huge success. One of the all-time great season-ending episodes, “Kancelled” uses guest stars better than most. The Gabbo bits are hilarious, as is Krusty’s degradation. The climactic comeback show works wonderfully, and “Worker and Parasite” offers one of the series’ best moments. “Kancelled” is a serious winner. 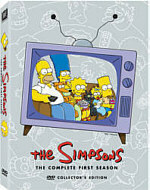 The Simpsons: The Complete Fourth Season appears in an aspect ratio of 1.33:1 on these single-sided, double-layered DVDs; due to those dimensions, the image has not been enhanced for 16X9 televisions. Fans of the first three sets shouldn’t expect much new here, as the visuals looked very similar to those of the prior releases. As always, sharpness remained moderately erratic. Usually I thought the programs seemed acceptably concise and well-defined, but more than a few exceptions occurred. Close-up shots worked fine, but once we got beyond that realm, the images occasionally turned soft and a bit fuzzy. This never seemed terrible, but the shows lacked the definition I’d like. Some jagged edges showed up along the way, and a few signs of edge enhancement also appeared, though these didn’t seem too severe. As with prior seasons, a mix of source flaws cropped up at times. Most of these seemed related to weak clean-up animation, as the majority of them looked like specks and marks that weren’t erased along the way. Although these bits popped up throughout the shows, they weren’t terribly intrusive and they stayed pretty minor. Colors remained inconsistent but acceptable. The tones periodically looked a little heavy and thick, but they were fairly vivid and distinctive much of the time. Black levels also stayed consistent with past seasons. Though they failed to present great depth, they seemed reasonably tight and full. The occasional low-light shots seemed slightly too dark, but they never were terribly opaque. Season Four maintained the same standards as the prior year and offered decent but unexceptional visuals. In addition, the Dolby Digital 5.1 audio of The Simpsons remained consistent with the sound heard during the first three seasons, and that seemed fine to me. Overall, the soundfield maintained a very strong emphasis on the front speakers. Occasionally, the surrounds added some general reinforcement, but they remained passive as a whole; they maintained general ambience and that was about all. At times, I heard elements move from the front to the rear, but environmental elements dominated. Within the forward domain, the audio seemed pretty lively and active. Admittedly, much of the sound stayed basically monaural. Score and other music demonstrated very nice stereo imaging, and the environmental elements popped up on the sides whenever logical. Because the programs remained dialogue-based overall, the mixes didn’t go nuts, but they added a good sense of space and environment to the presentation. Audio quality also seemed very good. I noticed a little more edge to some speech than I’d like, but usually the lines sounded natural and distinct, and I heard no concerns related to intelligibility. Effects remained a fairly minor part of the mix, but those elements seemed accurate and lively throughout the shows, and they also provided decent bass response when necessary. Music appeared quite bright and rich. From the score to various songs, these elements appeared vivid and dynamic and really came across well. 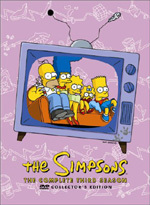 Ultimately, The Simpsons provided a very satisfying auditory experience for this sort of program. As with the first three packages, The Complete Fourth Season includes a moderate roster of extras. All 22 episodes provide audio commentaries. These tracks present an ever-changing roster of participants, though a few constants occur. On all 22 commentaries, we hear from writer and creator Matt Groening plus executive producer Al Jean. In addition, we greet others intermittently. The tracks feature director Rich Moore (6, 12, 19, 22), supervising director David Silverman (1, 8, 11, 12, 15, 20 ,22), animation director Wes Archer (15), executive producer Mike Reiss (2, 6, 8, 11, 12, 13, 14, 16, 18, 19, 20, 22), writer Jon Vitti (5, 9, 14, 18), director Jim Reardon (3, 7, 9, 13, 16, 21), director Mark Kirkland (1, 4, 10, 17), writer Wally Wolodarsky (5, 17), writer Jay Kogen (5, 17), writer Jeff Martin (2, 4, 10), animation director Jeffrey Lynch (7, 14, 18, 20, 21), writer Josh Weinstein (7, 21), writer Bill Oakley (7, 21), writer Adam Lapidus (19), writer David Stern (13, 16), producer Frank Mula (15), writer Michael Carrington (11), writer Conan O’Brien (8), writer George Meyer (3) and voice actors Jon Lovitz and Hank Azaria (2). While the Season Three set added fairly heavy participation from voice talent, the actors barely pop up here. “A Streetcar Named Marge” includes Jon Lovitz and Hank Azaria, who don’t give us lots of details, but they help make it fun. I don’t know why the remaining tracks lacked other actors, but they were missed. Otherwise, we return to an emphasis on directors, writers and animators. One notable presence comes from former writer Conan O’Brien, who shows up for one program. It’s interesting to view the way the others treat him, as the track comes across like the return of the conquering hero; he definitely receives much more deference than one might expect, and the others kind of mock themselves when they speak of him elsewhere. As for the rest of the commentaries, they will remind fans of the tracks found on the prior three sets. That means a lot of general notes and asides but not an incredible amount of information about the shows and the series. I find it hard to remember many specifics, though some come to mind. We hear about issues connected to bringing in guest stars and some who turned down the series; “Brother from the Same Planet” goes into the rejection they got from Tom Cruise. Mostly the tracks seem anecdotal, and the loose structure generally makes them fun. I consistently enjoyed them and thought they went by quickly. Objectively, they don’t present terrific coverage of the shows, and they tend to focus on “I like that gag” comments a lot of the time. Nonetheless, they seem fun, at least for die-hard fans like me. I can’t call the commentaries great, but I think they’re very entertaining overall. A mix of other supplements spread across all four DVDs. Each one includes something called Animation Showcase. This allows us to use the “angle” feature to check out some scenes at different levels of completion. We can flip between storyboards, animatics and the finished product for “A Streetcar Named Marge”, “Homer’s Triple Bypass”, and “So It’s Come to This: A Simpsons Clip Show”, while “Itchy and Scratchy: The Movie” presents all of those elements except for the animatics. It’s a fairly fun interactive way to check out the stages of completion. We get animatics on all the discs except for DVD Two. These appear for “A Streetcar Named Marge” (17 minutes, five seconds), “Homer’s Triple Bypass” (eight minutes, 25 seconds), and “So It’s Come to This: A Simpsons Clip Show” (six minutes). The first two come with commentary from Rich Moore and David Silverman, who also use a telestrator to illustrate some points. They discuss variations between the animatics and the final show, various techniques, and how they use the animatics to shape the end product. For the set’s deleted scenes, we go to DVDs Three and Four. They include cut sequences from “Homer’s Triple Bypass” (four clips) and “The Front” (six segments), respectively. We can view these independently or activate a feature that lets us check them out during the proper episodes; at the appropriate time, an icon comes onscreen, and if you hit “enter”, you’ll see the cut sequence. The snippets run between eight seconds and 22 seconds, so don’t expect a ton of material. Nonetheless, the bits are fun to watch and they include some amusing gags and alternate scenes. DVD One gives us the majority of the features that don’t appear on more than one platter, and we start with A Word from Matt Groening. It runs 115 seconds as we hear an intro from Groening that runs over a montage of show clips. It basically just tells us of a bunch of the season’s moments and feels promotional, which seems odd, as we already own the package. It’s a pretty bland and generic introduction to the DVDs. Next we find a pair of featurettes. The five-minute Bush Vs. Simpson looks at the ruckus caused when former First Lady Barbara Bush slammed The Simpsons. Executive producer Jim Brooks talks about this, the response sent to her from “Marge”, Barbara’s good-natured retort, and the aftermath from there when the President criticized the show. Brooks discusses a dinner which he attended along with both Bushes and their reaction to him. The featurette’s moderately informative, though I think we’ve heard most of this information on prior DVDs, and it oddly omits mention of the series’ volley at the Bushes when they had the couple move in next to the Simpsons. In The Cajun Controversy, we hear about how the residents of New Orleans reacted to one song from Streetcar! This two-minute and 13-second piece presents comments from writer Jeff Martin with show clips. He discusses his intentions for the tune and the flap that arose over it. He also goes over some basics about the episode itself. If you’ve already listened to the commentary, you’ll have the information, which makes this recap redundant. The Promotional Stuff domain presents a general featurette. We hear from Groening, Brooks, composer Alf Clausen and actors Nancy Cartwright, Adam West, Leonard Nimoy and Danny De Vito as they offer basic thoughts about the series and the characters. Indeed, this is “promotional stuff”, as the 13-minute and 54-second program mainly just acts as an excuse to give us show clips without much content. However, we do get short shots of the cast in action, which seems fun. As we head to DVD Two, we find some commercials. This section includes four ads. “Compulsion: and “Unforgettable Classics” promote The Simpsons with unusual circumstances; the latter seems especially cool, as it plops the characters into film clips from famous Fox flicks like Star Wars. We also find one promo each for Butterfinger and KFC. When we get to DVD Three, we find a bonus commentary for “Marge Vs. the Monorail”. This track includes remarks from Groening, Reiss, Jean, Moore, Silverman, and Conan O’Brien. It’s good to hear from O’Brien again, as he adds some funny remarks. The commentary otherwise seems similar to the rest of them; it doesn’t prove tremendously informative, but it’s fun. Inside the DVD’s case, we get a funny introductory note from Matt Groening. He provided a similar statement for the first three sets. While my review copy didn’t include one, prior packages also included nice booklets with episode guides and production notes, and I expect this one will as well. Some folks call Season Four of The Simpsons the series’ all-time best, and I can’t find much reason to fault that. Of the year’s 22 programs, only two fall into my list of bland programs, as even the gratuitous clip show offers a lot of laughs. The DVDs present visuals and audio that seem very similar to those of prior sets, and the extras continue to inform and entertain. Season Four definitely stands as an excellent package of humor, and this release comes with a very strong recommendation from me.